Today arrive at Dibrugarh airport and then drive to Tinsukia (40 kms / 01 hrs drive), reach Tinsukia and check into hotel and overnight stay. After breakfast visit Maguri Beel on a country boat (without motor). Maguri Beel is a wetland located just outside the Dibru Saikhowa National Park and Biosphere Reserve. After lunch go for another excursion on country made boat to Dibru Saikhowa National Park. Evening back to lodge and at leisure. Overnight at Tinsukia. Today go for another boat ride in Dibru Saikhowa National Park for half day, explore the bird and wildlife and you might encounter the Endangered River Dolphin. Later back to Tinsukia and proceed to Jorhat (265 kms / 05 hrs drive), reach Jorhat and check into hotel and evening at rest. Overnight stay at Jorhat. Today very early morning we will drive to Gibbon WLS ( the only Gibbon Sanctuary in India) , in Gibbon one can find six primates, many birds and butterflies, take a walk along with the Forest Guard ( 03 hrs walk – depending on interest), ( Breakfast will be packed from Hotel) later drive back to Jorhat ( 22 kms) and after refreshment drive to Kaziranga National Park ( 100 kms / 03 hrs drive), day at leisure in Kaziranga NP. 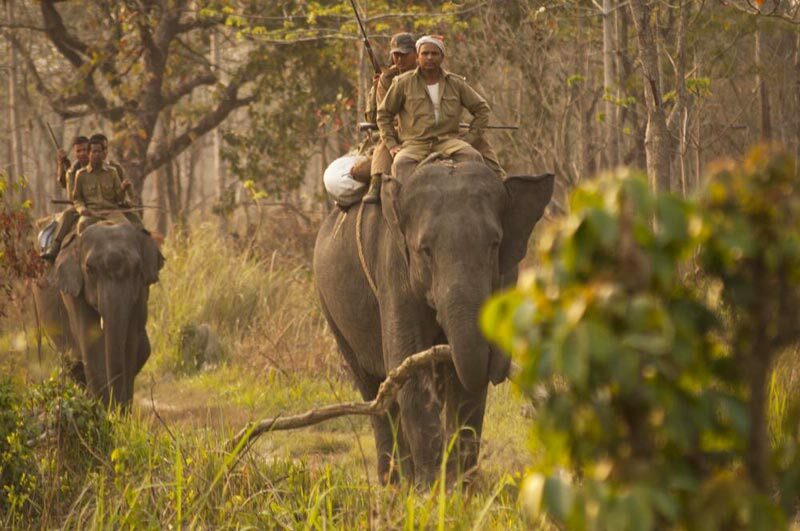 Overnight stay at Kaziranga. 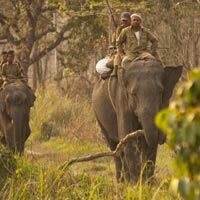 Today after breakfast you will be driven to Manas National Park (235 kms / 06 ½ hrs drive), reach Manas and check into hotel, evening at leisure. Overnight stay at Manas. Today early morning go for an Elephant Ride inside the national park (timing: 06:00 AM / 07:00 AM) for 40 min of ride, return back to lodge and after breakfast and refreshment go for a walk into nearby villages and also visit a Tea Garden, later after lunch go for a Jeep safari in the Mathunguri Range of the park, spend around 4-5 hrs inside the national park, back to lodge and overnight stay.